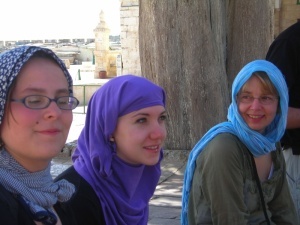 The girls of the group cover their head (scarf or shirt, anything will do) as a sign of respect for the place and we walk to the Mosque, which is NOT the high building with the golden dome but a more discreet edifice just in front, reserved for men on Fridays (which is prayer-day) - women can go on the other days, must then stay at the back of the room. 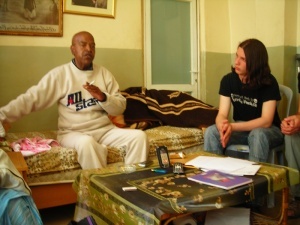 Daoud leads us now into the African district of Jerusalem where we meet Ali Jiddah who welcomes us in his (tiny) home and starts telling us about the black Palestinians as well as about his own itinerary. He is really impressive, kind of a mafia-godfather but he is a great man who opens for us another door into the history of this country. We literally drink in his words (his English is excellent, by the way)... : "The Afro-Palestinians of this district arrived in Jerusalem in two successive waves : during the British Mandate and in 1948. They don’t want to go back home because they want to be the first to meet God on Doomsday, which will take place in Jerusalem". Concerning his skin-colour, Ali confides to us that "Afro-Palestinians have never been discriminated against by the other Palestinians, on the contrary : they have a respectable position in the Palestinian society (mixed marriages for example, are well-considered). In the Israeli society however, where discrimination is almost an ideology, Ethiopian Jews really suffer from it". Ali tells us about his own life-route : he went to college in Jerusalem but had to stop his studies and start working at the age of 17 to help his father financially. From then on, he really felt what it meant for the Palestinians to be under Israeli occupation... He enrolled in the PFLP (Popular Front for the Liberation of Palestine). He tells us he once put a bomb that killed Israeli citizens, which earned him 20 years imprisonment. He wouldn’t do it again, he says, not because he is afraid of going to prison : today he has got children and knows the value of life. "There is another reason, he adds, which is more political. I know there are progressive Israeli, people who believe in a peaceful solution : the creation of one democratic secular state for everybody, and I surely don’t want to hurt them". Ali tells us how happy he is to meet us : "You are the proof that a minority abroad is aware of and sensitive to the Palestinians’ fate : all states are indeed rather pro-Israeli." And he says he would love it if we bore witness to the present situation in Palestine when we go back home. When we ask him if he is still a member of the PFLP, he answers that if he admitted it he would be sent back to prison. But then he says that he is really addicted to politics, and more especially to the PFLP. "Yet taking part in the conflict means risking having to pay for the consequences of it ", he warns us, : for example, he can’t get the medical treatment he currently needs (he seems to have had a CVA, his right hand is paralysed). To a question by Tanguy, Ali answers that the ultimate aim of the PFLP is not the creation of two states, a Jewish one and a Palestinian one which should only be an intermediary step, allowing time for building bridges between the two camps. "If occupation was stopped, the people here would be normal people again : they wouldn’t have to face unfair situations, of which the children are the first victims? They will suffer (already suffer) from the psychological sequels of all this violence". We leave Ali’s little house, overwhelmed with so much information and rejoice being back in the light and warmth of the sun : we follow Daoud up to the Nidal Centre where children give us a rap-song and a little traditional dance show, before taking us to the Palestinian village Silwan where they present a musical entertainment organised within the context of a demonstration aiming at drawing people’s attention on the lot of the village. "On Saturday, February 21, 2009, the occupation town council sent an evacuation order to 134 families from Al-Quds, that is 1500 people living in the Al-Bustan district of Silwan in the southern suburb of the Al-Aqsa mosque. Their houses will be demolished to leave room for a park : "King David’s Garden". 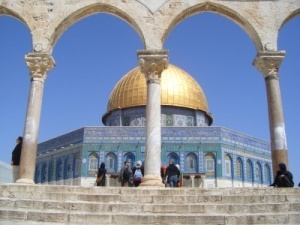 This measure is part of the parallel project to set up a Jewish centre in place of the old town and its surroundings, so as to isolate the Al-Aqsa mosque from its Palestinian environment and create a continuity between the settlements scattered around the town and the old city." 1500 people are going to be thrown out of their homes because Israel wants to build an amusement park...! The inhabitants have been resisting for one year exactly and are celebrating this anniversary. 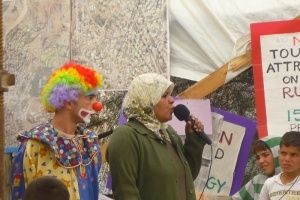 Unfortunately we can’t stay until the show starts but we listen to the speeches, and more especially to the really moving one of the oldest inhabitant of the village who asks us and other foreigners to tell our families and friends what Palestinian people teach to their children : peace. 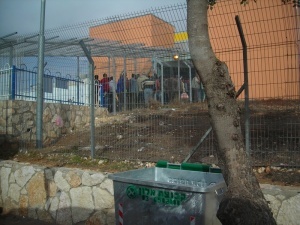 We quickly drop in at the youth hostel to fetch our luggage, jump on a bus that leaves us a bit later at Bethlehem checkpoint which we will have to go through on foot. 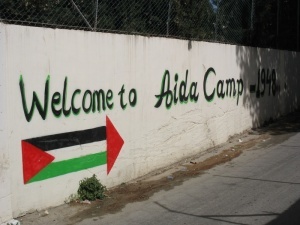 On the other side of it, the boys and girls of the refugee camp of Aida are expecting us. This is an awful moment for each of us, probably the most awful in the whole trip. We take our bags and cases out of the bus trunk and find ourselves in the middle of a crowd of Palestinians (mostly men) all back from work and (patiently) waiting for the gates to open. ..
All of a sudden there is a mad scramble to get inside ! The Palestinians rush forwards, jostling each other and us. But at the end of the first zig-zag, an armed Israeli soldier yells out at them and puts some order into it all. The people organise themselves in two lines that move forward slowly as soon as each of these men goes through the scanning machine : documents, pockets, bags, then the turnstiles which we imagine could spit us back all sliced ! The Indian file meanders to a kind of empty intermediary parking place before passing through a second control post, other turnstiles and eventually enters an open-air corridor that looks exactly like those you sent circus wild cats through. 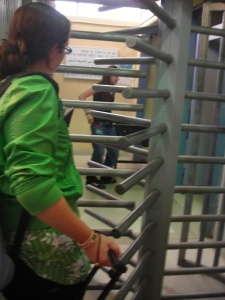 There seems to be a special entrance for the tourists but it is out of the question for us to be more worthy than those Palestinians : we wait for our turn, undergo the same controls and questions (less brutal than at the airport though), go through the turnstiles that get stuck (not made for a man and his guitar) then the wild cat cage or, as Bénédicte puts it , the death passage. In front of us, there is a woman with two little children obviously frightened by the scramble, the shouts, the metallic noises and who start crying. 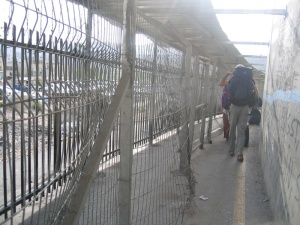 At the end of this iron corridor, another kind of crowd swallows us : the calls of the Palestinians stallholders mingle with the horn concert of all the cars that have come to fetch the workers back from "the other side", the side of the Free Israel. But we welcome the contrast : we leave behind the soldiers’ coldness and arrogance , that of a dehumanising system and throw ourselves into a festival of colours and smells... Thank God, Martine is there to meet us and she leads us to taxis that drive us to the refugee camp of Aida where we’ll be staying for ten days with the boys and girls of Al-Rowwad cultural centre. Salaam welcomes us in Aida. She is the young girl with whom had exchanged mails and prepared our 10-day stay in the camp with. The pictures she sent help us now recognize some of the smiling faces that are with her : there is Mazen, Ribal, Mustapha, Jamal, Ahmed... Our English is more or less at the same level : we understand each other, that’s the most important and we quite easily connect with each other. We are delighted to hear that, after briefly discussing it together, they have decided to let our group stay together in the guest house contrary to what had been announced (we should normally have been scattered over different families of the camp. Martine will confide to us later that our cheerful friendly faces and our sensible look have created a good impression : they have had trouble with a certain number of volunteers who had little respect for the places made available to them...). 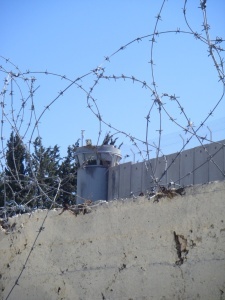 Afterwards, we all go for a short walk through the camp and up to the borders of the town of Bethlehem which is surrounded by the separating wall. We clearly notice what great care our friends take of us : they behave like real bodyguards, anxious that we should feel safe and well. We tease them a bit about it but then we realise that it is not only a question of honour for them that everything is OK with us : these precautions are indeed not superfluous. Nobody knows us here (yet) and not everybody is necessarily happy to see us among them.